Trex Privacy Fencing is incredibly popular in California and it’s not some short-lived trend. More and more homeowners are choosing Trex as their first fence in a new home, to replace an old, broken down fence, or even to install a pool fence. Trex Fencing is made up of quality composite materials and many clients find the 25-year residential warranty especially appealing. 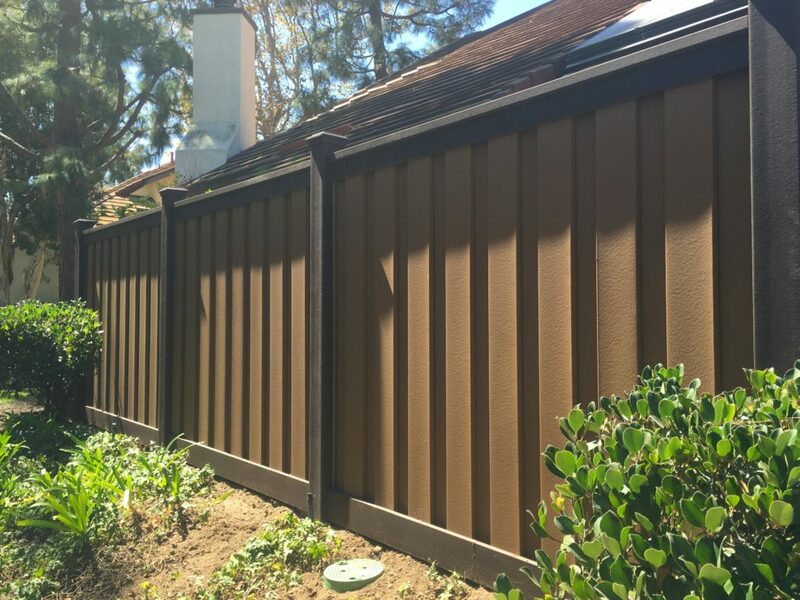 We’re featuring this beautiful fence located in El Segundo, California as an example of what to expect when you have a Trex Fence. When building a new fence, it’s natural to do some research to determine which fence is right for you. Very few people will call the first fence contractor they find on google and ask them to install whatever fence they think is best. Most people spend time researching both the contractor and the fence type that will fit their needs and their budget. Fencing is a large purchase and it’s perfectly reasonable to take your time with the big decision. But Trex is such a great fencing material that we’re never surprised when a customer ultimately chooses Trex. This homeowner in El Segundo, California was most interested in Trex’s low-maintenance qualities. No painting or staining is ever needed, unlike a wood fence. While vinyl fencing doesn’t need staining either, it’s not really low-maintenance when you’re constantly repairing it. Trex was also chosen over vinyl because it has a more classic wood-like appearance, something that doesn’t look like cheap plastic. And unlike the thin and hollow vinyl fencing, Trex is solid and dense and does a much better job at blocking ambient noise. This homeowner planned to replace their old wood fence with Trex Composite Fencing. Unlike wood, Trex won’t peel or split, and this rich color will last without staining. Greg Ethenoz at Beyond Decks was the contractor and installer on this job. It’s just as important to choose the right contractor as it is to choose the right fencing material. Greg is best known for his deck, patio covers, and deck-over-seawall installations (check out his YouTube channel), and has worked with Trex Decking for over 11 years. His quality craftsmanship and his appreciation for Trex is what led him to add Trex Fencing to his portfolio. Greg highly recommends Trex Fencing to all those who are looking for a quality fence. His tip to homeowners is to budget for a good fence, rather than leaving it as an afterthought when you are building your home or redoing your landscaping. Often times people will prioritize their deck and when it comes time to build your fence, all you can afford is a cheap fence that you’ll have to replace in a few years. It’s better to build the best fence now and never worry about it again. This old wood gate was warping and unstable on its hinges. Trex Fencing has a very similar design to the classic wood fence, but it doesn’t experience the same warping over time. For this El Segundo residence, approximately 200 feet of Woodland Brown Trex Seclusions Fencing was used. The verticle style Seclusions gives the classic appearance of a board-on-board fence. Because of the sloping in the yard and the masonry wall along a portion of the perimeter, the installation of this Trex Fence was unique. The height of the fence varied throughout the yard. In some places, the fence was as tall as 8ft. When installed on top of the existing concrete wall, the Trex Fence was only 4ft high. When a yard has a minor slope like the one here, Greg recommends stepping the fence for a cleaner look, and to ensure there are no gaps underneath the fence. Another great feature of Trex is how easy it is to work with. It can be cut to any height, stepped or sloped, installed in the dirt or on top of concrete. For this job, Trex Fencing was even used as an enclosure for pool equipment. The final result is beautiful. The appearance of a classic wood fence with none of the maintenance. This client will never have to deal with warping, rotting, painting or staining and their fence will always be private and secure. Even though this yard is on a slope, the Trex Fence was stepped on top of the existing masonry wall for a clean, modern look. If you’re interested in your very own Trex Privacy Fence and you live in the Thousand Oaks area, visit Greg’s website. If you don’t live in California, don’t worry, we have great Trex contractors all over the nation. Contact us to find a Trex Friendly fence company near you. Check out our fence laws and regulations pages for Southern California cities in the LA and Orange Counties. You’ll find information on local fence laws, obtaining permits, and links to helpful info. If you’ve ever driven a car in the United States, you’ve probably seen a Love’s Travel Stop. Soon, you’ll be able to see Trex Fencing at several of their locations. Trex is working with Love’s to install utility and dumpster enclosures as well as perimeter fencing in an effort to improve the customer experience. Trex is ideal for commercial projects because of its low maintenance, natural aesthetic, and durability. Trex is used as a divider between the gas station and truck parking. Love’s Travel Stops are found all over the U.S.
Dumpster enclosures might not be as glamorous as a California beach fence, but Trex Fencing is versatile. Trex, unlike dumpsters and utility boxes, has a natural appearance that complements the surrounding landscape. Love’s chose the lighter Saddle color, which has the look of a classic wood fence. And the interlocking pickets make it completely private. But don’t be fooled by the attractive facade. Trex is an incredibly strong and durable fence. With a hurricane-force wind rating and a strength that surpasses wood and vinyl, Trex Fencing is great for security. For added strength, the gates on some of these dumpster enclosures were reinforced with steel. Trex is used as a dumpster enclosure for Love’s Travel Stop. And businesses love Trex, because they don’t have to budget for yearly fence maintenance, making it cost-effective. Trex is easily cleaned with a bit of soap and water, and it will never need painting or staining to keep it looking good. 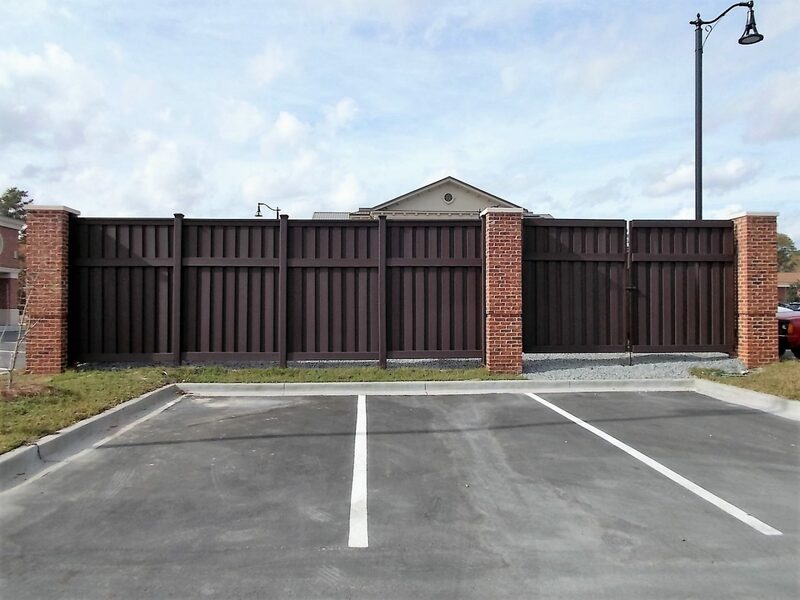 In addition to their utility and dumpster enclosures, Trex was used in a more typical fashion as privacy perimeter fencing. Often installed between the gas station and the truck stop, the Trex Fence acts as a barrier to reduce noise and improve the landscape. Love’s is trading chain link for Trex. Utilities are protected and out of sight. Steel posts were added for strength. Trex Posts set easily in concrete. We understand that appearances are important. A clean landscape and an attractive fence, with dumpsters and utilities out of sight, are more appealing to a customer. And Love’s is committed to a great customer experience, whether you’re driving a semi-truck or a minivan. Greg Sells of Ace Quality Fencing installed the Trex Fence at the Paris, TX Love’s Travel Stop. He loves working with Trex because it is beautiful and easy to install. Greg highly recommends Trex to all his customers, so if you live in the North Texas, Southern Oklahoma, Southwest Arkansas or North West Louisiana area, give him a call! Utility enclosures have never looked better. We’ve featured Trex Privacy Fencing in large, landscaped yards, businesses with hundreds of feet of perimeter fencing, and backyards with beautiful pools surrounded by Trex. This Baltimore alleyway yard and Trex Fence might be compact, but there’s nothing small about the impact. In cities where everything seems crowded and real estate is valuable, it’s important to make the most out of your property. A Trex Fence can enhance curb appeal, provide privacy and security, and significantly reduce the hours spent on maintenance and repairs. For homeowner Chris, Trex was the clear choice for his back alley fencing. To begin this project, the existing chain link and old wood fence were removed. Continental Landscaping then installed the 6ft tall Saddle colored Trex fence and the existing concrete posts worked well as accents. It only took 80ft of Trex Seclusions to transform this small space. And because Trex has the same board-on-board look on both sides, it’s considered a neighbor-friendly fence. Chris chose Trex because of its strength and durability, as well as its clean, classic appearance. And he is happy to report that, six months later, his Trex Fence has held up well and still looks great. Before, this yard was little more than a parking space. The view from above shows off the 6ft tall Trex Seclusions Fence with the concrete posts. In addition to the new Trex Fence, cosmetic upgrades were also made to this small yard. The ground was leveled and bricks were laid. A raised garden bed was installed along the side, perfect for decorative plants or a small vegetable garden. Other potted plants and trees were placed around the perimeter to add greenery and the Trex Fence is the perfect background. There was even enough space for a grill, a table and chairs, and a parked car. And while the yard is still open into the back alley, Trex’s interlocking pickets provide some privacy for a family BBQ or late night drinks with friends. After Trex Fencing was installed, this yard was transformed into a space to be enjoyed. Trex Privacy Fencing in the color Saddle is a beautiful backdrop for this garden. A unique issue with alleyway fencing is the possibility of a car bumping into the fence. We would never suggest deliberately hitting a fence and every fence, even a concrete wall will sustain some damage after a substantial hit. But for those less forceful nicks and scrapes in a small alleyway, Trex is more durable and sturdier than vinyl and wood. This testimonial by a car dealership with Trex Fencing shows exactly what Trex can handle. Landscape and yard size doesn’t really matter when you have the right tools and a good plan. From a rolling farm to a city alleyway, any space can be a backyard escape, with Trex. All the best landscapes have two things in common, thoughtful planning and a Trex Fence. A customer in South Carolina did just that to create this beautiful, spacious yard. Months before any work actually began in the yard, the homeowner began his research. He wanted a fence that was private, secure, and something that actually looked good. Many days were spent researching various kinds of composite fences including SimTek, EndWood, Illusions, and Trex. He went to home shows and collected as much information as he could about the products. Ultimately, he decided to use Trex because of its proven durability and natural appearance. It’s a fence that withstands the weather, and wouldn’t be destroyed if a tree were to fall. And he definitely wasn’t interested in something that needed regular upkeep and repair. And the homeowner decided that a Trex Fence that would provide the perfect backdrop to his newly landscaped yard. After deciding on Trex, he went to his local Lowe’s store. Lowe’s was able to special order the Trex Fencing and also connect him with a nearby contractor. While this fence installer had never worked with Trex before, all it took was a few minutes on the phone with our national sales team to figure out how to install the fence. And thanks to this customer’s in-depth research, he was able to help. After completing the 8ft tall Woodland Brown Trex Seclusions Fence, the fencer said it was the greatest fence he had ever installed. The customer also chose a pair his Trex Fence with 4ft tall Alumi-Guard fencing in the front portion of his yard along with a small side gate. Trex matches ornamental fencing very well, especially to break up the look of a solid fence and to allow some visibility into the yard. The 8ft tall Trex Fence with an aluminum gate. From concept to completion this project took about a year, including the research, planning and clearing the some of the trees. But the customer says it was well worth it. He is awestruck every time he looks out his window and he is absolutely thrilled with his Trex Fence. He says that even people walking down the street will stop to admire and comment on his fence. He couldn’t be more proud. Trex Fencing is the perfect backdrop for landscaping. A view from the front yard before installing Trex. Much of the yard had to be cleared of trees before landscaping began. The view from the side of the house before the fence and gate were installed. Trex integrates well with an ornamental metal fence. Woodland Brown Trex Fence with trees and shed. Trex Fencing with a 4ft aluminum gate. We were thrilled to hear that Bonnie is proud of her fence, but we can’t say we were surprised. Trex is a product that is built to survive all the extremes of nature, including the tornado and hurricane force winds. No one should be looking out their window during a storm only to find that their fence is flying through their yard. Trex is strong, tested to wind speeds up to 110 mph and wind gusts to 130 mph. Click here to view the independent wind-load testing results. Often, fences require gaps to allow some wind to pass through, rendering them semi-private, but the special design of the Trex Seclusions and the Trex Horizons fences allow for complete privacy, while also still being windproof. Trex is a wind resistant fence because the composite material is strong, durable and much thicker than other products on the market. And Trex guarantees that your fence will stay safe and secure with a 25-year residential warranty. Whether you’re living in Tornado Alley or just a windy part of town, Trex is the best fence for you. But we can’t take all the credit. Buzz Custom Fence installed this Trex Seclusions fence and quickly replaced the 2 bottom rails after the storm. We’d like to thank Buzz Custom Fence for the installation, repairs and their representation of Trex Fencing. We are proud to be partnered with this great company. Buzz Custom Fence is a family-owned business started in 1999 by Denise and Eric Schrader. Together, they have built a company staffed by hard-working individuals who work together as a team to provide beautiful fences and gates for homes, schools, and businesses all over North Texas. Among our many options for fencing, we are proud to partner with Trex to offer visually stunning and durable composite fences. If you’re in the Northern Texas area and are interested in your very own tornado-proof Trex Fence, contact Buzz Custom Fence. Have a story about your Trex Fence that you’d like to share? Big Bend National Park in beautiful southwest Texas is one of the latest customers of Trex Fencing. Trex was selected to create privacy screens around composting toilets situated near Emory Peak, at the base of the ascent to the highest point in Big Bend National Park. All of the fencing materials were hauled in via a mule pack string as there are no roads or other way to access this location. A second location along the trail will be installed in 2017. Trex Seclusions interlocking pickets are a perfect solution for privacy screens. Combined with durable, rot-free Trex Fencing posts, the privacy screens will endure the climate and use for which they are intended. Woodland Brown, the selected color, provides a natural, low-profile appearance that blends into the environment around the service areas. The composting toilets at the Big Bend National Park are environmentally-friendly service areas that consume no electricity and provide vital services for hikers. Trex is proud to supply building materials to ensure responsible care of natural resources in our national parks. For more information about the trail, visit Big Bend National Park . To learn more about how Trex Fencing privacy screens were selected for the composting toilets, contact Erik Walker at [email protected] or 432-477-2316. 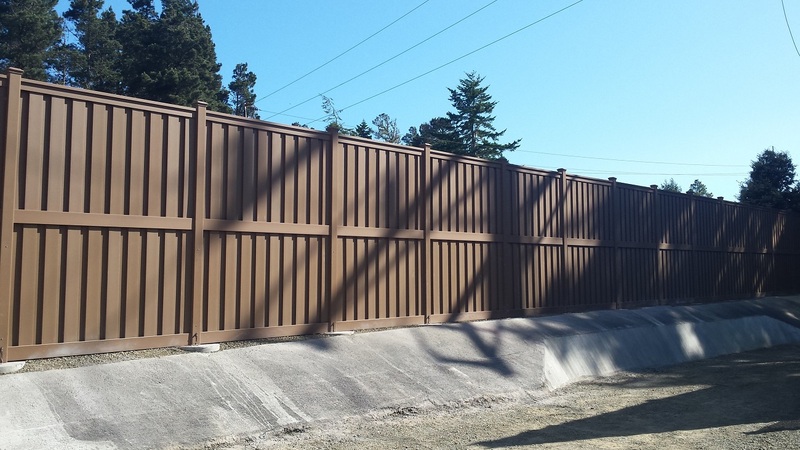 The California-based utility company, Pacific Gas and Electric (PG&E), recently selected Trex Fencing to enclose a substation in Mendocino, CA. Chain Link Fence & Supply (Livermore, CA) installed the fence. Like many commercial projects using Trex, the fence height is 10′ tall. The color installed is Saddle, and the total length of fencing is 230′. Trex was selected because it provides sound suppression and a unique, attractive appearance that reduces the industrial look of the substation. The fence completely blocks the view of the equipment behind it. Adverse soil conditions required a deeper foundation for the posts than normal. The architectural design called for 96″ post holes, filled with concrete. Galvanized steel posts were embedded in the concrete and extended up out of the ground so the Trex posts could sleeve over them. 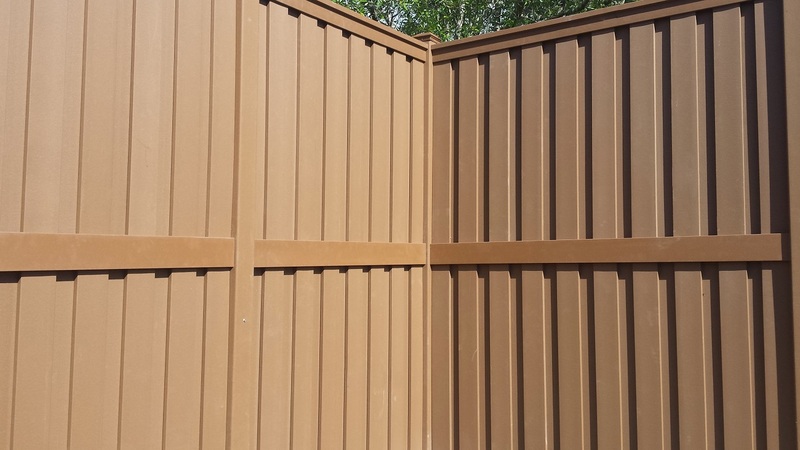 One of the advantages of a Trex Seclusions post is that for fences up to 8′ tall, they do not require reinforcement, but because the posts are hollow they also can be used as sleeves for taller fences such as this one. Trex fencing is a popular choice for these types of applications. Utility and dumpster enclosures, as well as perimeter fencing or privacy screens, utilize the high durability and aesthetically pleasing benefits of the product. Most privacy fences are limited to 6′ or 8′ heights, but with Trex, heights up to 12′ tall are possible. For technical details regarding Trex Fencing, including architectural drawings and installation guides, please visit our resource support page. 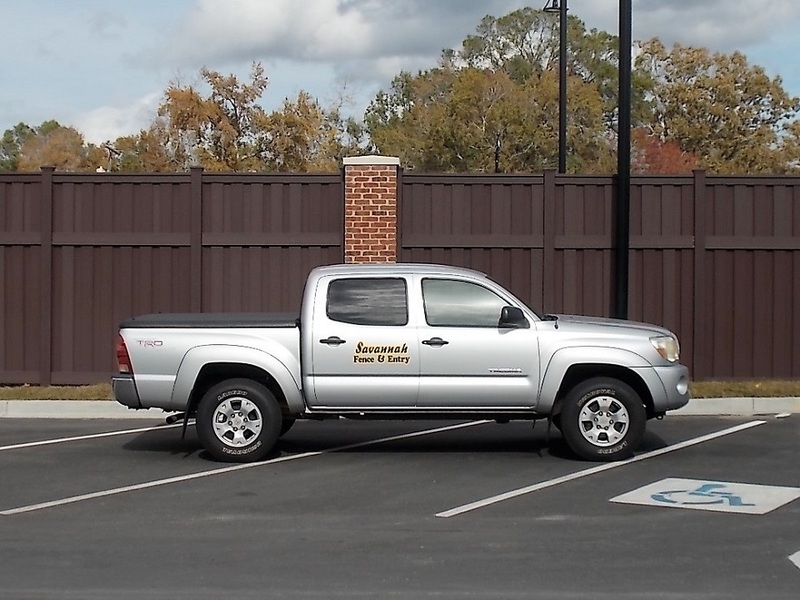 Savannah Fence & Entry Systems of Savannah, Georgia recently installed a Trex Seclusions fence for the city of Pooler. The new city hall complex in Pooler required a privacy area around a portion of the new town square and selected Trex fencing. In addition to its low-maintenance and aesthetic benefits, Trex was selected because it was able to be built to the required 10 ft. tall height. The color selected was Woodland Brown. The new city hall in Pooler is part of a development project that has been in the works for years. The nod towards a historical square is part of the city government’s vision to provide an area which will hearken back to the traditional appeal and function of a city government space. The area will also eventually include a walkable community and will help revitalize the section of town running along the Highway 80 corridor. Watch the WOTC reported on the city hall project. Trex is a perfect compliment to the new property. The architecture firm that designed the building and surrounding area, Hussey Gay Bell, was tasked with developing a property that would serve the city for several decades. With Trex, the city chose a fence that will last much longer than wood and will not require the upkeep of a typical fence. The brickwork columns provide a beautiful contrast to the wood-look Trex Seclusions fence. The fence was attached to the brick columns by cutting Trex posts in half and mounting them to a treated 2×4 that was anchored to the column. A new First Citizens National Bank building recently was constructed in Union City, Tennessee. One of the design elements of the new property was the installation of approximately 100 ft. of Trex Fencing in the Saddle color with the slim profile crown post cap. The fence serves as a parking lot barrier between the bank and an adjacent apartment building. Union City is a city in Obion County, located in northwest Tennessee. It has a population base of approximately 11,000 people and maintains several historical buildings and landmarks. With its beautiful brick architecture and local businesses, the Union City downtown area is an attractive example of a small town in the southeastern United States. Trex fencing provides a stately, natural appeal that compliments a variety of structures such as those found in downtown Union City. Trex fencing was specified for the building project by the McGehee, Nicholson, Burke Architects firm based in Memphis. Trex was selected for its unique, complimentary aesthetics, long-term economic value, and low-maintenance attributes. 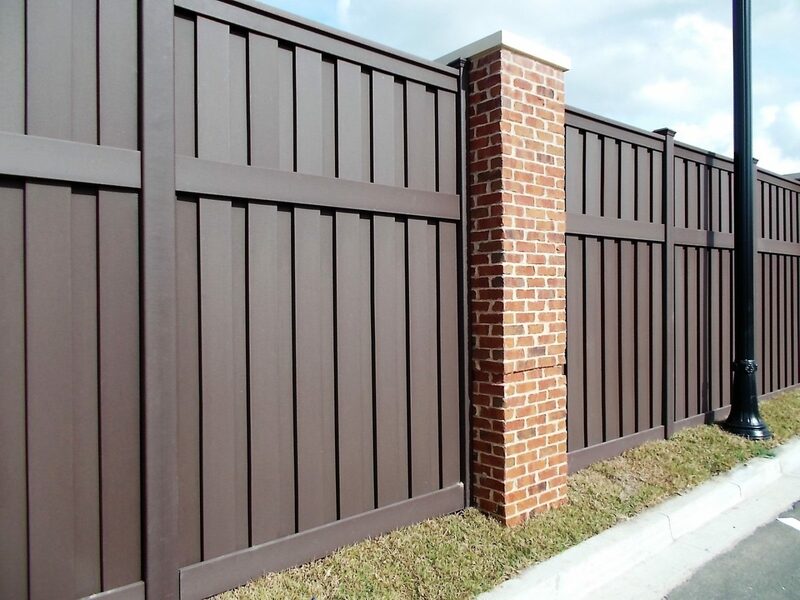 Trex is often requested for commercial projects specifically because it does not require painting or staining, and will not rot or degrade like wood fencing. The fence is exceptionally durable, providing long-lasting beauty to properties. The fencing materials were supplied by City Lumber Company in Jackson, Tennessee. While City Lumber primarily serves contractors and retail customers in the Jackson area, the company will supply the entire southeast region on a case-by-case basis. Contact Holly Dozier for more information on how to purchase Trex fencing from City Lumber. 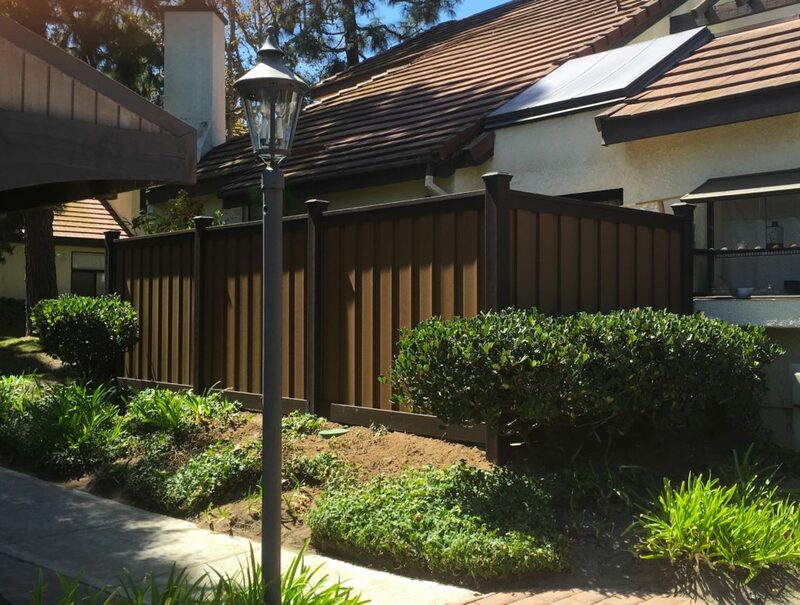 A Homeowners’ Association in the Los Angeles South Bay area recently selected Trex Fencing to replace existing wood fence. The association previously had installed a fence with tan colored pickets and dark brown posts and trim rails, so they were able to stay with their color themes by using Saddle Trex pickets in combination with Woodland Brown posts and rails. The HOA board selected Trex fencing after extensive research. Besides wanting to stay with the color combination theme, the association wanted a low-maintenance, durable alternative to the wood fencing. The Torrance-based HOA will replace approximately 3,000 linear feet of fencing in multiple phases. The fence will surround patio areas for ground level units. Another distinct aspect is the utilization of angle adapters to accommodate the trapezoidal shape of many of the units. Patio enclosures are a practical design option for urban-based homeowner associations in California such as one for Plaza Condominiums in San Diego. Trex is easily adjustable to shorter heights which is often a requirement for HOAs. With its fully enclosed profile, Trex is also a good solution for reducing sound and providing privacy. We’ve talked about the many benefits of the Trex Seclusions interlocking picket system. Here’s another one: creativity. For this particular project, the pickets were cut and placed underneath the deck to create a secure storage space. They provided a perfect solution for closing off space underneath while also showing an attractive finished look. Additionally, since the pickets are made out of Trex’s long-lasting composite, they won’t rot in spite of their contact with the ground. The skirting on this deck was used for a neat decorative finish. The color selected was Woodland Brown which compliments the rest of the deck. The board-on-board appearance of the Trex pickets gives a series of distinctive shadow-lines. Do you have your own creative use of Trex fencing components or a completed project you would like to share? Email pictures and details to [email protected]. The Hercules Fence branch in Norfolk, Virginia recently completed the installation of Trex Seclusions fencing and gates in the Saddle color for a new elementary school in Norfolk. 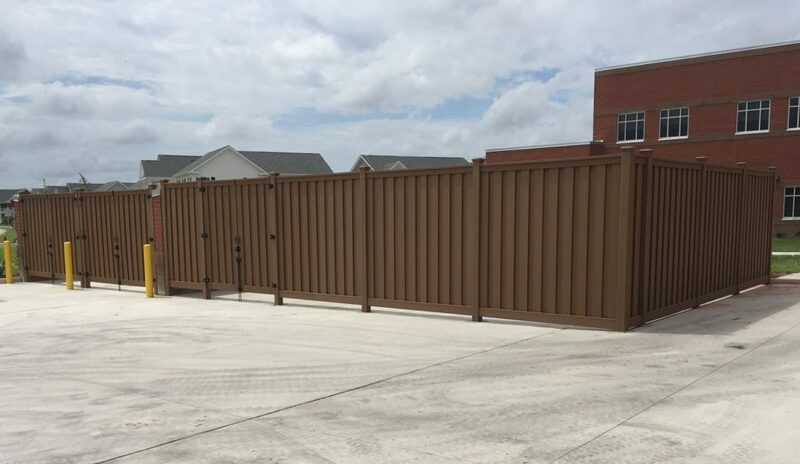 The project was comprised of fencing and access gates for a utility enclosure, and large gates for dumpster units. To provide security and suppress noise from the equipment, the fence was built eight feet all. Construction for the Richard Bowling Elementary School building began in 2015 and the school will open Fall 2016, providing education for over 700 students. The new school building is part of a large multi-school construction project in Norfolk. According to Ishmel Harps, Project Manager for Hercules Fence, a collaboration of RRMM Architects and Livas Group Architects, PC designed five school projects in Norfolk, Virginia utilizing Trex materials for the dumpster enclosures. The architects chose Trex based on its appearance and long-standing durability. 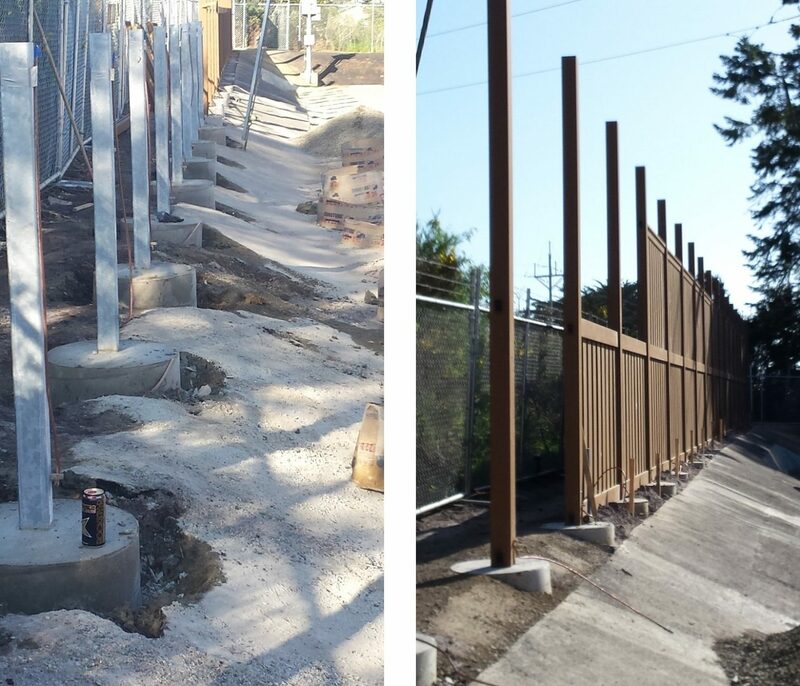 Hercules Fence was hired by the general contractor, SB Ballard Construction Company, to install each of the projects. The first project, Richard Bowling Elementary School, has been completed and all parties are pleased with the appearance and installation of the Trex system. About Hercules Fence. Hercules has been in business for over 50 years and maintains five locations serving all of Eastern Virginia as well the DC Metro area. The company serves both commercial and residential customers. For additional information about this project or how Hercules Fence can provide you with an estimate for Trex in the Norfolk area, contact Ishmel Harps at 757-321-6713. Sometimes a fence serves strictly as a decorative barrier rather than a privacy structure. This is an example of an interesting design from Utah where the contractor combined Trex posts, post caps, and rails with 2×2 lumber to create a 4 ft. tall square lattice fence. We’ve seen similar work done before with iron panels, wood balusters, mesh, and even bamboo. The Trex rails easily allow panels or balusters to slide into them effectively sandwiching the other material to hold it in place. In this particular application, the installer made a rectangular panel with a frame surrounding the 2x2s so he could drop the panel into the bottom rail, screw the sides to the Trex posts, and place the top rail over the frame. The top rail was then screwed down to the Trex brackets to hold everything together. Orange, Texas – In a small Texas city, the town government is making big improvements to one of its local offices with Trex Fencing. The Central Fire Station for the City of Orange, Texas just got a makeover. The city outfitted the station with Winchester Grey Trex Seclusions perimeter fencing and a dumpster enclosure. This 300 ft. installation of composite fence was just what the City of Orange was looking for with its clean design, weather resistance, and long-lasting color. This Trex Seclusions fence ties the fire station in seamlessly with the surrounding houses, but successfully seperates the properties. The dumpster enclosure enhances the appearance of the property by covering the unsightly appearance of the dumpster and any loose trash that may potentially fall out. Trex Fencing is the ideal solution for government properties as it provides complete privacy and security, while alleviating the need for constant repair and aesthetic upkeep. Trex Fencing will never need to be stained and is highly resistant to harsh weather conditions. Even in hurricane prone areas like Orange, Texas, Trex fencing can stand up to any storm that comes its way. Trex Fencing insures that your city’s investment will last a very long time while offering a clean and high-end appearance.